The look in the child’s eyes cannot be explained in words. We can look at this behavior as “intentional,” or “being funny,” or “disrespectful,” and the list is endless, but we need to stop and understand what autism spectrum disorder (ASD) is before we jump to conclusions. All it requires to understand is a little sensitivity, acceptance, understanding, willingness, and change of mindset. ASD is a group of developmental disabilities that can cause significant social, communication, and behavioral challenges. People with ASD handle information differently than other people, such as limited verbal language, intense self-stimulatory behaviors such as hand-flapping, under-reactions to pain and over-reactions to sounds, very good gross motor skills, and weaknesses in fine motor skills. These symptoms may vary widely from person to person, as no two individuals are alike. Observed behaviors, which might be seen as simple “naughtiness” or “non-compliance,” may in fact have a range of other meanings for a child with autism. This behavior may in fact be the child’s only way of indicating a need: for help or attention, to escape from stressful situations, of obtaining desired objects, of demonstrating his/her lack of understanding, of protesting against unwanted events, or of gaining stimulation. Having said this, the need to interact with them is also different. Provide a very clear structure and a set of daily routine (including for play). Use clear language. Avoid humor/irony, or phrases like “my feet are killing me” or “it’s raining cats and dogs,” which may cause bewilderment. Make clear (including with a firm “no”) which behaviors are unacceptable. Avoid sentences like “Would you like to do this?” or “Why did you do that?” It is always more beneficial to give a child some choices. Keep visual timetables, which are a great resource for helping a child stay organized. Recognize changes in manner or behavior may reflect anxiety or stress, such as talking loudly, pacing the room up and down, flapping hands, or collar biting (which may be triggered by a change to routine). It is very important to identify the triggers and address them. Calm with mindfulness or breathing exercises. Utilize sensory inputs such as playing with a sensory ball or squeeze ball, trampoline jumping, and rocking, which are all behaviors that may help calm. 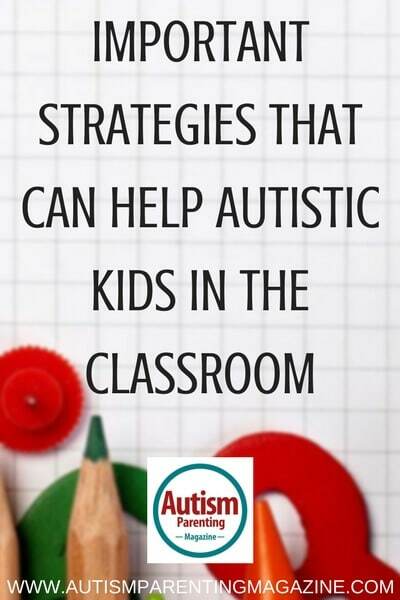 Classroom situations with children with autism can be overwhelming at times; however, success is possible if you plan and utilize strategies. The Golden Rule is not to do something once or twice, but consistently for things to fall in place. Give prompts (key words) for a child to get started with a writing piece. Be prepared that it may take two to three drafts before it is complete. Highlight the important keywords to help the student stay on topic. Increase font size and allow more spacing (with less clutter) to help the child understand the content better and improve focus. Use an edit wheel which outlines the basics of writing to provide a checklist to the student for punctuation (using capitals for start of sentence or name of place, person, full stop, neat work, etc.). Provide two to three choices to foster independence, but not too many so that it leads to confusion. Strive for quality rather than quantity. Smaller assignments broken down over chunks of time can help the child stay calm and focused. Make positive comments such as “It’s going well,” “You’re doing fine,” and “Well done.” Kids with autism need the boost in self-esteem. Provide a movement break for three to five minutes to help the child recover. Sometimes children experience sensory overload with so many things happening around them. Talk about any impending adjustment in the daily schedule, such as a change of route while travelling or special events in school. A message can also be sent to the parents to prompt them to talk with the child and prepare for change. Use alerting cues such as “This is important” to help a child focus at the right time. Some other ways can be to signal that someone has to answer, use the child’s name, stand close and pat, or walk around the classroom. Help the child develop eye contact, if possible. However, do not insist as some children with autism find it difficult to focus visually and auditory at the same time. Keep the instructions simple and concrete. Reading between the lines can be a challenge. Reward attention and timely accomplishments, even if it not the standard of a class. Children need to have a sense of achievement. Place the child at the front of the classroom, or at the back if they are sensitive to touch. Give one direction at a time. Multiple instructions can be too much for the child to handle. Quietly repeat directions to him/her after they have been given to the rest of the class. Use a variety of materials and mediums as this not only helps a child with autism, but can be stimulating for all. Complete a task analysis, which means a check or prompt to ensure the child is on track and to ensure tasks are manageable and within the child’s attention span. Check the child’s understanding and have him/her repeat or rephrase instructions as necessary. Children with autism can misinterpret body language and abstract language. Practice newly acquired skills in different settings in order to foster generalization of that skill. Minimize distracting material like extra pens, colors, iPads, or laptops (if not required for work). Less clutter is often better. Create an individual work area or a concentration corner. Undoubtedly, this is easier said than done; however, it is not impossible. It is a learning process while understanding children with autism. There is no fixed strategy that will work as no two individuals are alike. So true, but mostly forgotten. We have all been trying to fit the child in the curriculum rather than making the curriculum suit the child’s needs. Each child with autism brings different abilities, challenges, and self-esteem issues. I firmly believe that if we nurture, it will make a positive impact on the child and learning in a big way. All it requires is sensitivity, patience, self-reflection, introspection, and a proactive approach with lots of positivity and understanding. Sonu Khosla a developmental psychologist with extensive experience working with children with special educational needs (SEN). Currently head of SEN at Pathways School in Noida, India, she has also conducted training modules and workshops for companies and educational organizations in the Netherlands. She has worked on research projects in association with Johns Hopkins Institute, Baltimore, USA.